With Vacuum cast system, it gives high standard quality results with regard to better surface and better ductility. 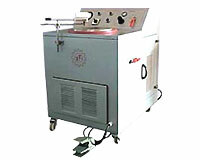 This machine is compact, economic and easy to operate. Flask dimension: 3.5", 4", 5", 6", 8"
Flask high: Up to 10"